A few years ago we decided to make our transition to Australia official, and we accepted Australian citizenship. We are now Australian. We are able to sing the anthem with pride and ownership. Our prime minister, for all his faults, is Malcolm Turnbull. Not Trumbull. Not Trunbull. Turnbull. Maybe Trump and co liked the matching pattern of ‘Trum’ even though it is not a matching pattern at all. Turnbull is not perfect, and Australia is not perfect, but it is a good place to live in. The benefits far outweigh the negatives. The people are relatively friendly, there are no wars, it is safe, we have fresh food, lamingtons, shelter, work, and also, in general, there is courtesy. We wait in queues if we have to. We make way if we have to. We are protected by anti-bullying and harassment laws. Which means the brash and disrespectful tone of other leaders towards our own leader hits hard. It leaves a bad taste in one’s mouth. It is unnecessary and uncalled for. It is bullying behavior. And it saddens me. For many of my WordPress friends are from the US. Good, kind people that have been lovely towards me. That I now count as friends. I feel really warm towards this wonderful, caring community. We had the opportunity to vacation in the beautiful state of California. 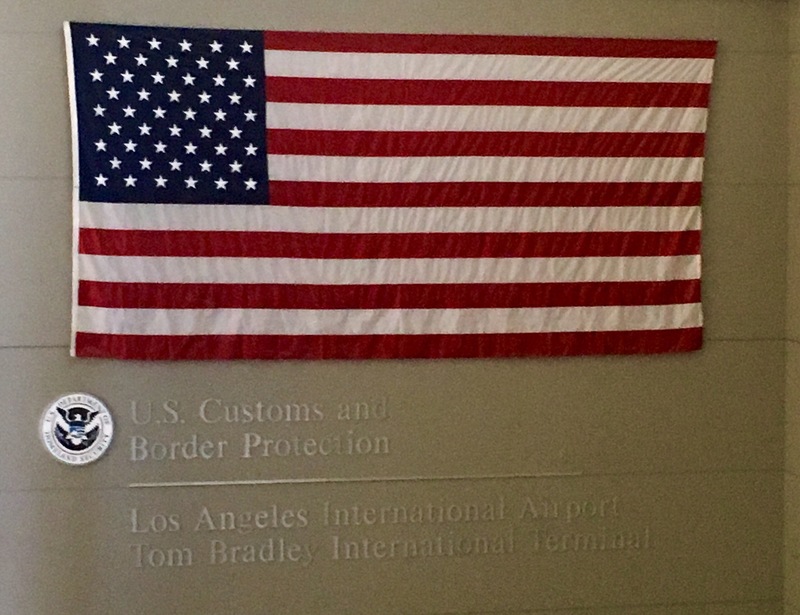 One of the first sights one sees upon entry into the United States is a flag, as well as framed photograph of POTUS. For us it was a smiling photo of Obama. I’m not across the policies that he had, but as a person he seemed like a decent human being. Courteous, respectful towards his wife, calm, considered etc. Not a bully. Our vacation timing worked out well. Otherwise we would now be facing a four year wait, at the very least. Ah…we have the same feeling here…one of “egg on the face”…such a nightmare for us and the world. I try and stay away from political commentary but why should we when POTUS’es of the world just bleat out whatever. I agree, total nightmare! I am an American and am ashamed of Donald Trump. I did not support him; I did not vote for him; I actively opposed him and continue to actively oppose his policies. I am so sorry for the way in which he treated your prime minister. I am watching TV news right now, and they just announced that Trump’s approval rating is the lowest of any president going all the way back to President Eisenhower in 1952. I am so embarrassed by the disrespect trump showed to your Prime Minister. I hope you know that most Americans abhor our president’s bullying ways. From an blogging friend in Australia. This should matter to every American. Trump speaks for the angry white man and for the angry white woman who thinks the world owes them. He speaks for racists and haters, he speaks for right-wing radicals. He speaks for people who care only about themselves. He doesn’t speak for me -he never will. I care! Many of here in the U.S. are under total shock. What an embarrassment he is. They say it’s going to get worse before it gets better and that I fear. This is going to be a very long four years and it will hurt many. I agree, it is frightening. So distressing and, yes, embarrassing. Add me to the list of Americans (although I’m also an immigrant) who didn’t support Trump and are horrified that he has come to power. I hate bullies! In this multi -connected world working together is better for people and it probably is for business as well. Someone would probably need to possess the ability to think and read to appreciate that, which eliminates Mr. Trump and his billionaire and millionaire appointees. Please keep in mind that despite this horrible situation, a majority of Americans did not vote for him. We certainly did elect him and now we need to stop him. I still have faith in the majority of people in this country and we are taking our country back. Hopefully when this is dark night is over you will again return to a more welcoming America.